Forever Manchester is delighted to announce that charity places for the 10k run are now officially sold out. 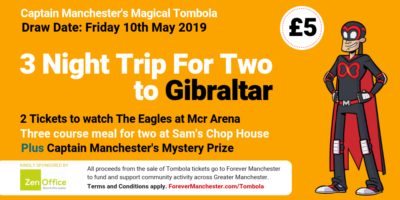 We had a limited amount of discounted places for Forever Manchester supporters to take advantage of, and they did just that! Discounted places were available for just £25 instead of the Great Run’s usual price of £38 and we now have over 50 runners running to raise money for Forever Manchester. Huge thank you goes to Corporate Partners Brother UK, Express Solicitors, Allied Irish Bank and Metronet (UK) who all have staff running to compete for the coveted Captain Manchester Cool Runnings Award. Not forgetting Ambassadors Rich Wood and Chris Marsh, who are once again tying up their running shoes to run for the communities across Greater Manchester that they love. As our charity places fill, all eyes are now on the businesses who are running to see who is in the chance of winning the Captain’s prize. Once you have signed up the best way to raise money is via JustGiving. JustGiving is an easy way to raise money for Forever Manchester during your 10k fundraising efforts. Head to our handy guide for tips on how to maintain and create your page.